A lot factors impact success in fantasy sports, but the No. 1 thing you can do is simple: Don’t be your own worst enemy. This column has led with various nuggets of fantasy wisdom that I’ve gained in my two decades as a player, but almost every piece of fantasy advice I can give comes back to that one central tenet. There’s a lot of uncertainty in fantasy sports. It’s the nature of the game. We set starting lineups without knowing what the ultimate outcome will be. Drew Brees was locked in fantasy lineups Thursday night, and that didn’t work out so well. But you know what? Starting Brees was the right move. While we may not have been able to see a bad game coming, we do know that Brees is better than most other options at quarterback on a weekly basis. So we start him. How often have you been in a situation where one of your better players is in a bad matchup and one of your marginal players is in a good matchup? This happens all the time. And how often to you bench the good player for the marginal player? There’s a good bet you’ve done that a few times. And how often has it worked for you? I’m willing to wager that it’s worked far less times than it’s backfired. There’s a secret in fantasy sports that the pros know and the casual player doesn’t. It’s actually surprisingly simple: good NFL players are more likely to perform better than marginal players. Sure, they don’t always outperform their marginal counterparts, but they do so far more often than they don’t. A skilled fantasy player knows this and realizes that he or she won’t be right with every play they make, but they put themselves in a position for success by making the best play every time. So here’s where we become our own worst enemy. If you think you’re going to outsmart fantasy football, you’re kidding yourself. You may get a creative play right once in a blue moon, but more often than not, fantasy is going to come right back around and bite you. Fantasy owners will be without Melvin Gordon this week, and perhaps next week as well. With Gordon sidelined, expect a healthy dose of Austin Ekeler, who figures to get a good chunk on Gordon’s work, especially in the passing game. The Steelers are a tough matchup, but Ekeler is still in play as a front-end RB2. Owners in deep leagues will also want to keep an eye on rookie Justin Jackson, who flashed upside in the run game last week. Like Gordon, Kerryon Johnson is trending toward being sidelined this week. 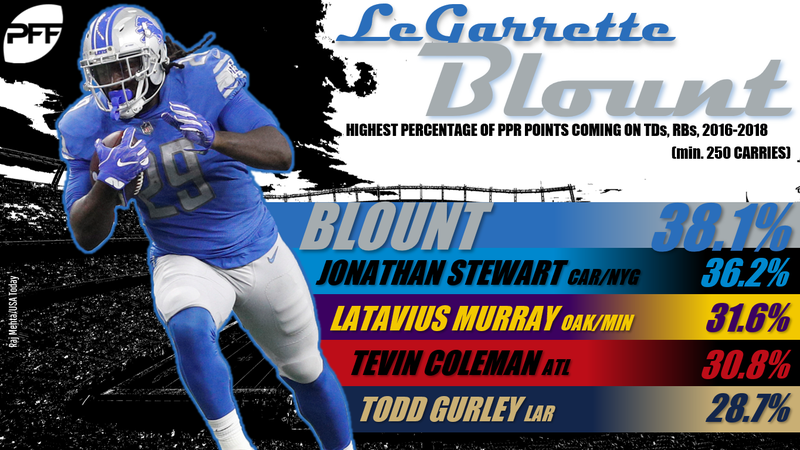 Johnson has been out with an MCL sprain, and we saw LeGarrette Blount dominate the carries in the Lions last outing. While it’s easy to fall in love with Blount’s stat line, keep in mind that he comes with minimal upside if he doesn’t find the end zone. Blount is best viewed as a flex option. The Packers have been banged up at their skill positions seemingly all season. Jimmy Graham is dealing with a thumb injury that has limited him in practice. With your fantasy playoff life on the line, it’s tough to trust Graham if he’s able to suit up this week. Randall Cobb has also been limited in practice this week. While Cobb would be a risky fantasy option if he’s able to return, his role in the offense could help open things back up for Marquez Valdes-Scantling. Gus Edwards gave the fantasy world a bit of a scare after the surprise breakout player missed practice on Wednesday with an ankle injury. But it looks like we can breathe a collective sigh of relief because Edwards got back in practice with a limited session on Thursday. Edwards figures to be in the mix as a solid RB2 option this week. More injury notes: Will A.J. Green return this week? The star wideout is trending in that direction after getting limited work in on Thursday. Green slots back in as a WR2 if he’s able to get back on the field. … Stefon Diggs has yet to practice this week, but he expects to play against the Patriots. … Doug Baldwin was limited in practice on Thursday. The veteran has been dinged up all season but remains the Seahawks leader in target share when he’s on the field. … Tyrell Williams has been limited in practice this week. His injury should pave the way for more work for Mike Williams this week. … Emmanuel Sanders popped up on the injury report on Thursday with a heel issue. This is likely nothing, but it’s still something worth monitoring heading into the weekend. … The Colts look like they’ll have Marlon Mack this weekend. Mack hasn’t cleared the concussion protocol yet, but his limited status on Thursday bodes well. … There’s a good chance Sammy Watkins sits this week. He’s dealing with a foot injury that hobbled him before the Chiefs’ bye and caused him to miss both practices this week. Tyreek Hill has been phenomenal this season and enters the week as fantasy’s No. 2 wide receiver. Expect the good times to continue to roll for Hill and the Chiefs offense this week with a plus matchup on tap against the Raiders. The Oakland secondary has allowed seven touchdowns to wide receivers over the last month. Hill should have no problem returning fantasy value in this matchup. Mike Evans didn’t fare particularly well in his last meeting against the Panthers with just one catch back in Week 9. He saw a shadow in that contest from James Bradberry, which we expect to play out again this week. However, we don’t expect a similar outcome. Bradberry has been a plus matchup for much of the season. He’s allowing 14.8 yards per catch and has surrendered five touchdowns on the season. The Panthers have a budding star on their hands in D.J. Moore. The rookie first-rounder has exploded over the last two weeks, racking up 15 catches on 16 targets for 248 yards and a score. Better yet, Moore gets to face a Tampa Bay secondary that has been very fantasy-friendly to opposing wide receivers. Look for Moore to excel in this contest, especially when he’s in Carlton Davis’ coverage. Davis has allowed three scores over his last five games. 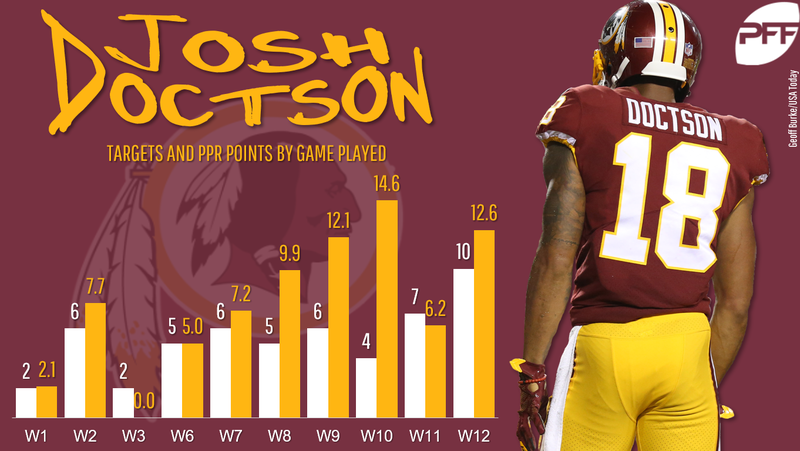 Josh Doctson hasn’t been the fantasy breakout some had hoped, but the young wideout finally showed some signs of life last week with six catches on 10 targets for 66 yards. Doctson is a sneaky deep play this week against the decimated Eagles secondary that is arguably the worst starting trio in the league right now. The Colts offense is surging this season, and T.Y. Hilton has been a big reason why. The veteran receiver has topped 100 receiving yards in each of his last two games with 16 catches and two touchdowns over that span. But things could cool off for Hilton this week, as he’s a good bet to see a shadow from Jalen Ramsey, assuming Ramsey makes it onto the field (he’s on the injury report). The Jags corner has held opposing receivers in check with just a 53% catch rate in his coverage this season. While he’s still an every-week WR1, Antonio Brown hasn’t necessarily been the elite fantasy option we’ve become accustomed to in fantasy football. Brown owners should never sit him, but it is worth noting that he’ll see Casey Hayward in coverage this week. Hayward has been impressive this season, with just a 55% catch rate in his coverage. He also hasn’t allowed more than two catches in his coverage since Week 4. Davante Adams is a touchdown machine and a target monster. Both of those things are very good for fantasy football. However, he’s a good bet to draw a shadow from Patrick Peterson this week. Opposing quarterbacks have avoided Peterson’s coverage this season with an average of just 3.6 targets per game thrown into Peterson’s coverage. It was a bit of a surprise to see Trumaine Johnson shadowing Josh Gordon last week, but Johnson did enough to keep Gordon relatively quiet. It could be another uneventful week for Gordon with coverage expected to come from. Xavier Rhodes. The Vikings corner is allowing just 10.2 yards per catch and has given up just two receiving scores on the season — and both of those touchdowns went to Davante Adams. Phillip Lindsay has been one of this year’s best fantasy stories. The undrafted rookie is currently 11th among running backs in fantasy scoring and is poised for another strong week of production. Lindsay gets a plus draw this week against a Bengals defense that has consistently gotten lit up by opposing running backs. Cincinnati has allowed at least one rushing score to running backs in each of their last six games, with five of those six backfields topping 100 yards. It didn’t happen right away this season, but Aaron Jones is now locked in as the Packers’ feature back. He’s racked up double-digit carries in each of his last five games with an impressive five rushing scores over that span. Jones is also seeing significant work in the passing game with 16 targets over the last three weeks. And the best part: he gets to face a Cardinals defense that has struggled against the run all season and has surrendered the most rushing scores to running backs (14) in 2018. It’s tough to like the Bears offense without Mitchell Trubisky under center, but Jordan Howard owners at least have a glimmer of hope. Howard will face a Giants defense that has allowed one rushing score to each of the last six backfields they’ve faced, with the last four backfields also topping 100 rushing yards. Howard is a risk/reward flex option. As we noted above, Marlon Mack will likely be back on the field this week, but it’s tough to endorse him with confidence against the Jaguars. Jacksonville has stuffed the run over the last month with zero rushing scores allowed to running backs and no backfield topping 100 rushing yards. The Atlanta run game just isn’t the same without Devonta Freeman. Tevin Coleman has been carrying the load, but he hasn’t had a 100-yard rushing performance since Week 2 and only has two rushing scores on the season. Coleman has scored five times as a receiver, but it’s never wise to count on your fantasy running back to find pay dirt through the air. Coleman is best viewed as a flex option this week against the tough Ravens run defense that currently allows the second-fewest fantasy points per game to running backs. Will Lamar Jackson be a fantasy league winner this year? Probably not, but he’s certainly a very interesting fantasy play this week because of what he can do with his legs. Jackson is a top-12 fantasy option against a Falcons defense that has struggled against the run and allows the second-most fantasy points per game to quarterbacks. 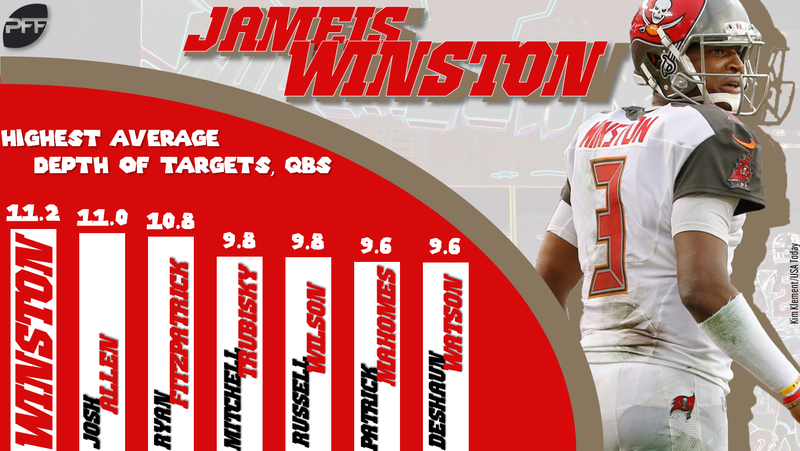 It’s tough to enter any week with much confidence in Jameis Winston as your starting fantasy quarterback, but he does have a few things working in his favor. Winston posted solid fantasy numbers last week with 312 passing yards and two scores. He also gets to face a Panthers defense that is currently the No. 6 fantasy matchup for quarterbacks. While Winston didn’t play in the Bucs Week 9 matchup against Carolina, Ryan Fitzpatrick was able to post four passing scores in that contest. Winston is always risky, but he’s a premium play this week. Tom Brady enters the week just 14th among quarterbacks in fantasy scoring. While he’s over 3,000 passing yards, the GOAT just hasn’t gotten it done from a touchdown standpoint, with just 19 through the first 12 weeks of the season. To make matters worse, Brady faces a Vikings pass defense that hasn’t allowed more than one passing score since Week 5. Since then, opposing passers are averaging just 195 passing yards per game. And it’s important to note that in that span, Minnesota has gone up against Drew Brees and Aaron Rodgers. While it may have seemed unthinkable when you drafted Brady this year, it’s a good idea to sit him this week, even if you have your fantasy playoffs life on the line. Sure, Baker Mayfield is rolling over his last two starts with seven passing touchdowns. But don’t get too cute with your start/sit decisions this week. Mayfield has to face a Texans defense that allows an average on one passing score per game since Week 4. At best, Mayfield is just inside this week’s top 20 fantasy quarterbacks, which means he shouldn’t be started in most leagues.